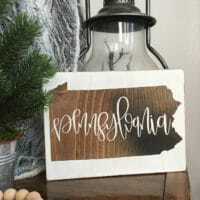 These scrabble wall tiles made from a wooden pallet are the perfect farmhouse wood wall decor for a gallery wall, large entryway, living room, or any space! 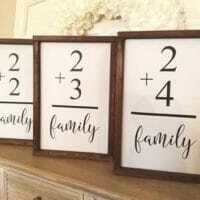 I’ve been looking for rustic wall decor to create the perfect gallery wall for years! I knew the kind of elements I wanted but just couldn’t seem to find the main item that would tie everything together. 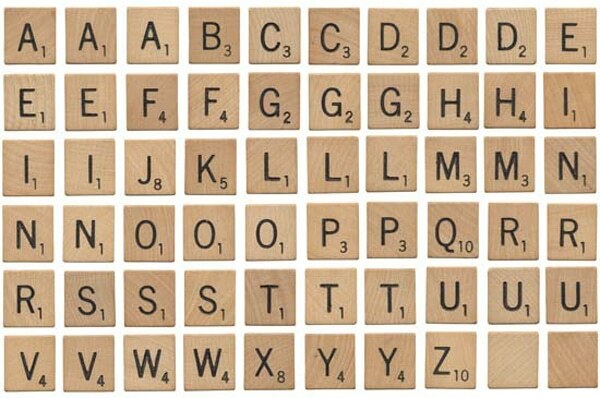 Then one night as I was scrolling through Facebook I found it – large scrabble wall tiles! I saw them and just LOVED them! I instantly could picture them as part of our entryway wall decor framed by all the rustic farmhouse decor I already had picked out. They would be perfect! 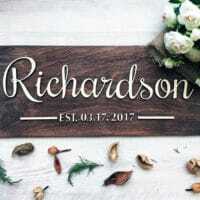 While buying them from an Etsy seller wasn’t really that bad of a price, with my new found love of pallets, I knew I could make them dirt cheap! Believe it or not, finding free pallets really isn’t hard at all. Most garden centers, hardware stores, and even grocery stores end up with an abundance of pallets that their shipments come in on. More often than not they are happy for you to take them off of their hands and give them away for free! 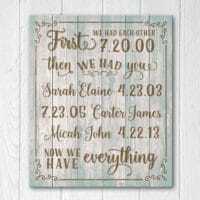 Not only are they usually free, but also have the perfect rustic look for my farmhouse decor. Wood pallets are definitely a favorite of mine! 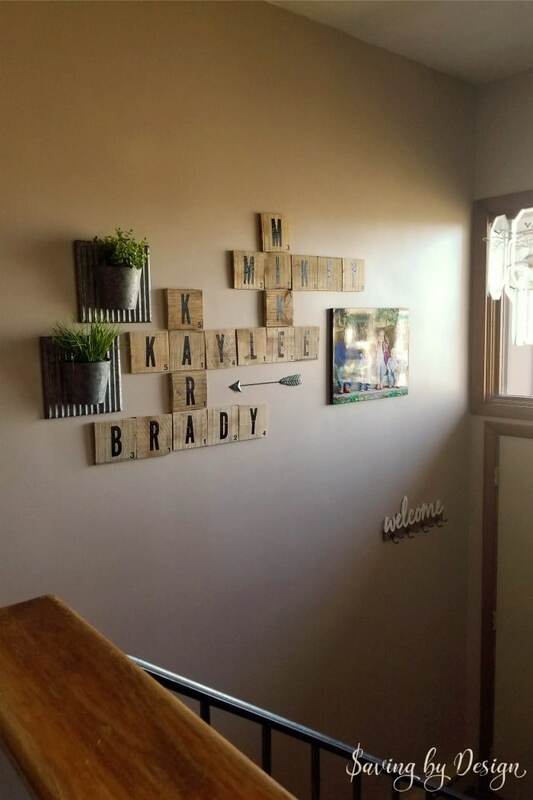 Decorating a large wall can be hard. You need decor large enough so it doesn’t look lost on the wall, but not too much that ends up overwhelming. When I was deciding what to put on our large entryway wall, the idea of a gallery wall was perfect. I just couldn’t figure out where to start. 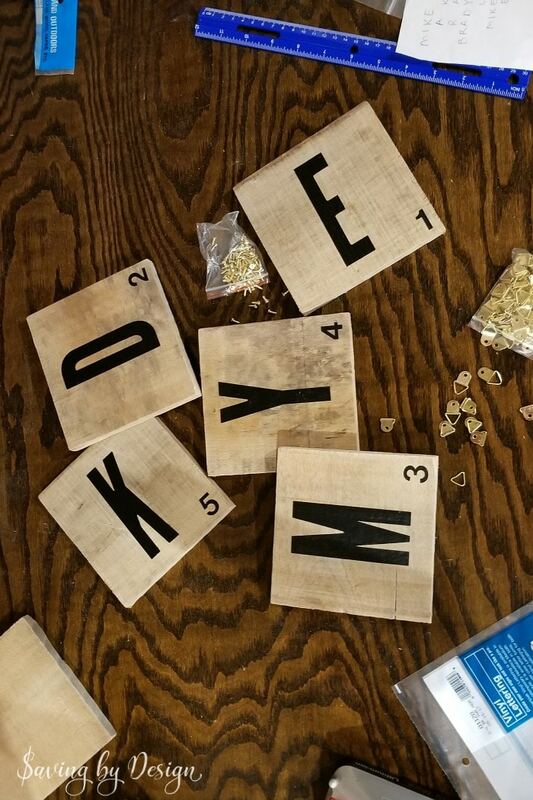 As I mentioned, once I saw those scrabble tiles, it all came together! 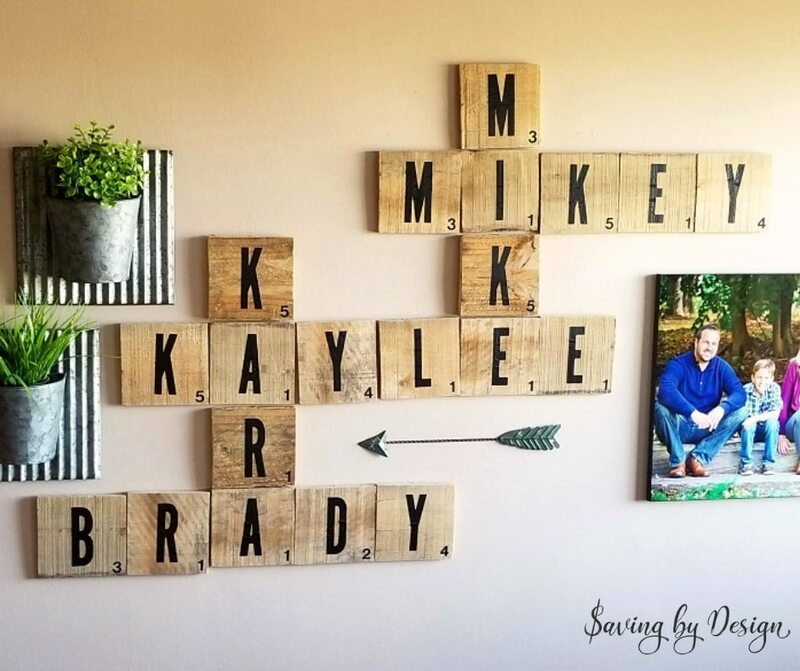 As you can see in the photo above, our scrabble wall tiles are the focal point, or star of the show, accented by some other rustic wall decor to bring it to life. 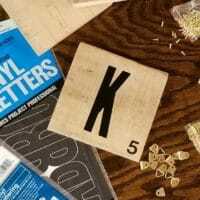 To get started making your scrabble tiles, you’ll need a plan! 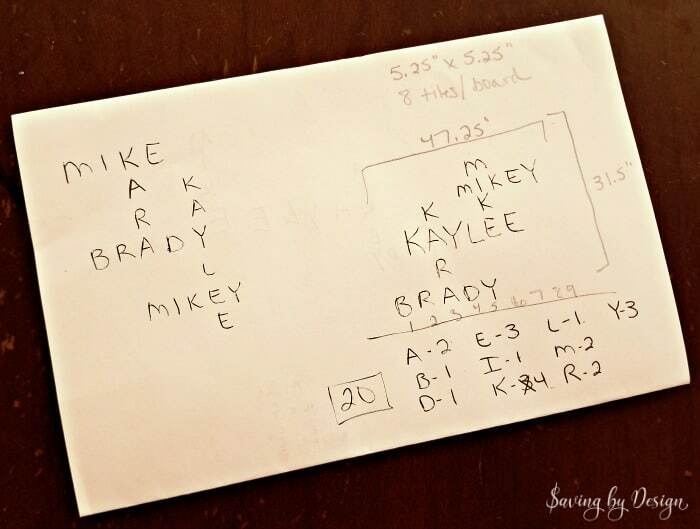 My oldest son and I sat down and came up with all the different design options we could think of. Some of them I loved and others would just look terrible on the wall we were using! 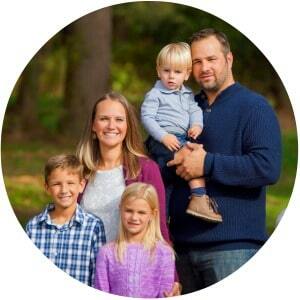 Try a few vertical designs and a few horizontal and see which one really stands out to you. 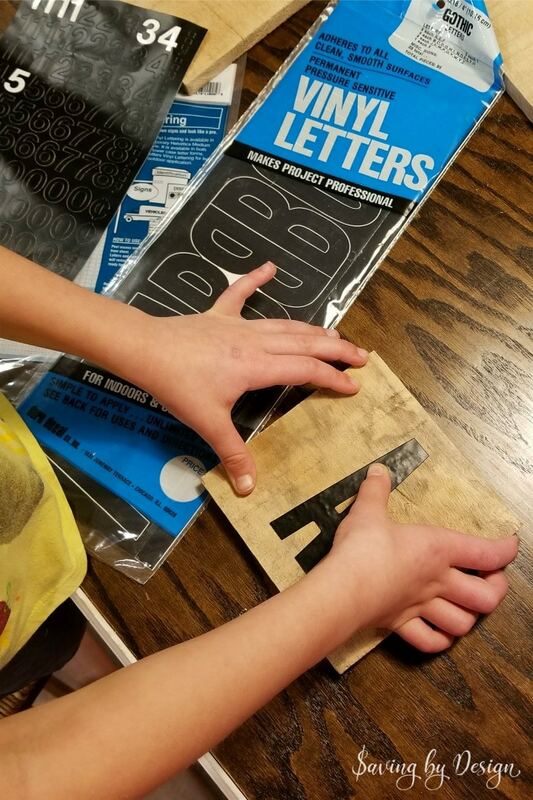 Once you decide on what formation you like best, you’ll need to count not only how many tiles you’ll need to make, but also the amount of each letter and number you’ll need. Of course we want your tiles to be as official as possible, so here are the point values assigned to each letter that I found at Something Turquoise. 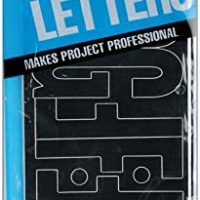 Pack includes 1 each – X, 2 each – J, K, M, P, Q, V, W, Y and Z, 3 each – B, C, D, G, H, L, N, O, R, S, T and U, 4 each – A, E and F, 5 each – I and 23 miscellaneous symbols and punctuation marks. 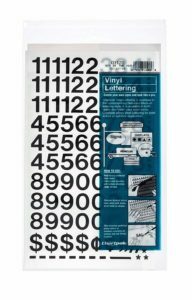 Pack includes 12 ones, 12 zeroes and 4 of all other numbers (2, 3, 4, 5, 6, 7, 8, 9). There are also miscellaneous symbols. 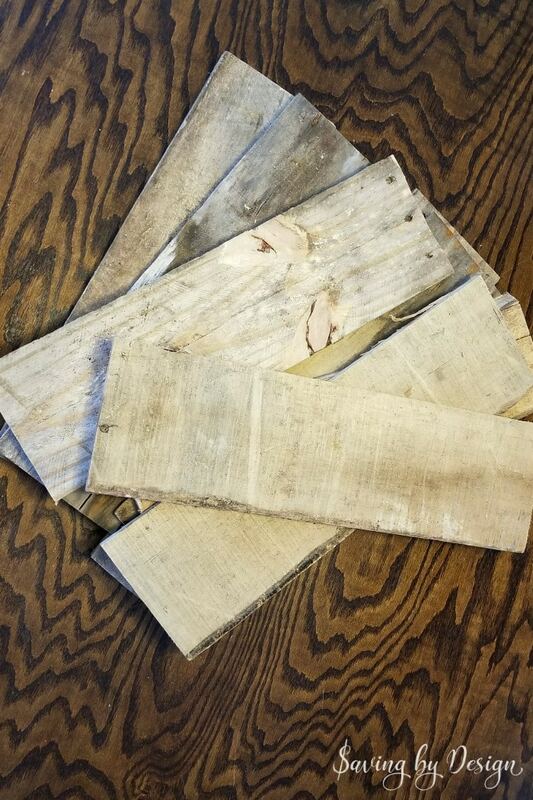 In past pallet projects we tried to pry the wood planks off, but it definitely wasn’t easy and we ended up with a few broken boards. 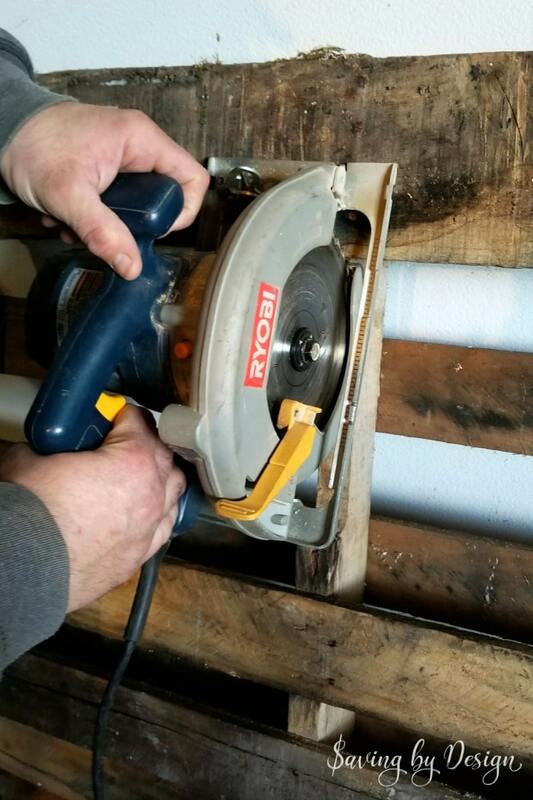 This time we decided to just bust out the power tools! 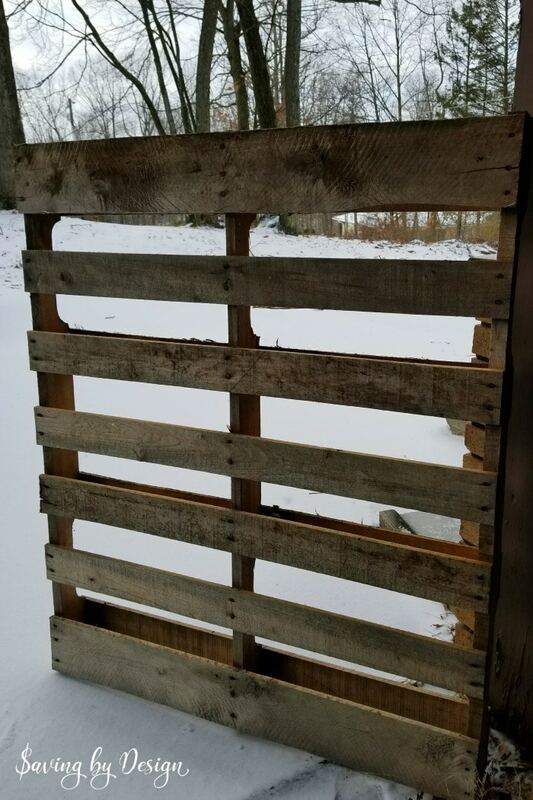 Once we removed the wood from the pallet, I cleaned the it using my trusty combination of 1/2 vinegar, 1/2 water, and a few drops of lemon essential oil. Look how sparkly clean they came out! 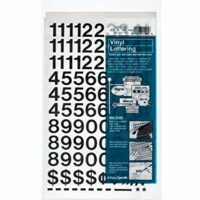 Make sure you allow them to dry completely (overnight or longer if possible) before moving on so your vinyl stickers adhere properly. 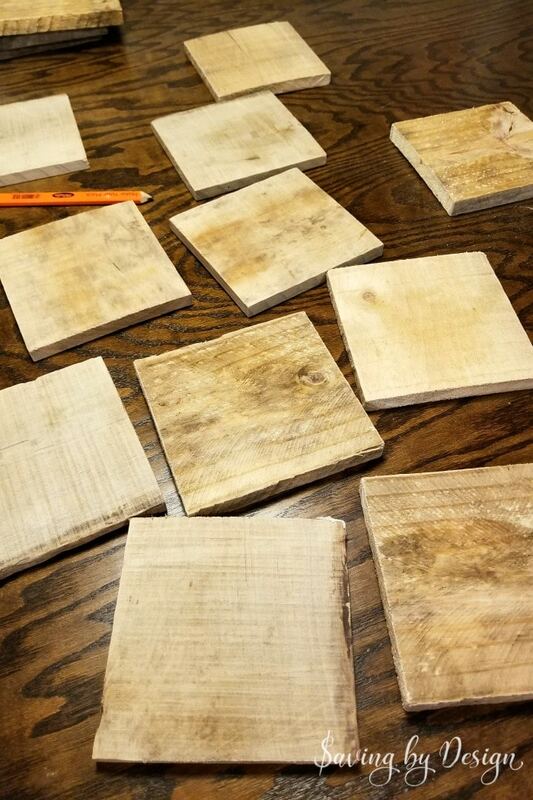 Once your planks have dried completely, cut them into squares using your saw. 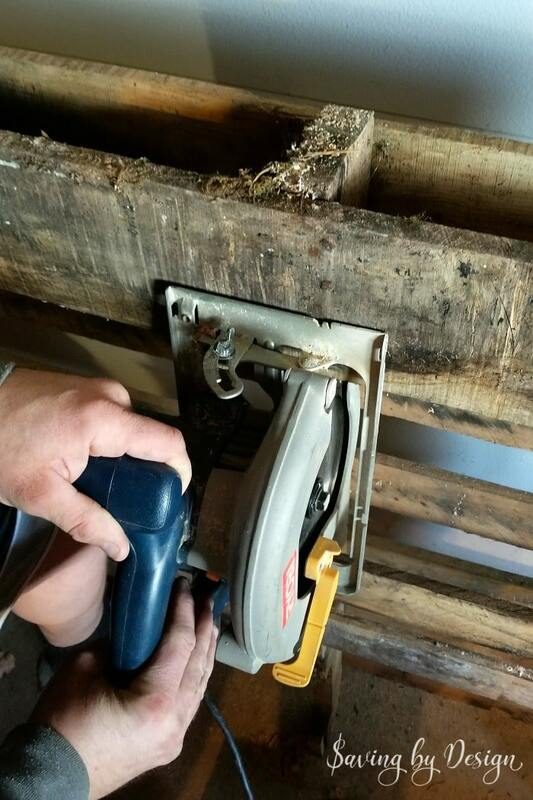 For us that was 5.25″ x 5.25″ since that was the width of the plank on our pallet. As you can see you’ll probably have many different textures from your pallet. 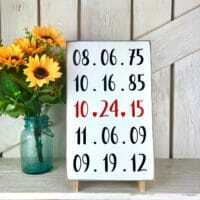 I liked this since I was going for a natural and rustic look for my scrabble wall decor. If you would like all the same texture you might need to use more than one pallet to create enough of the same type of tiles. 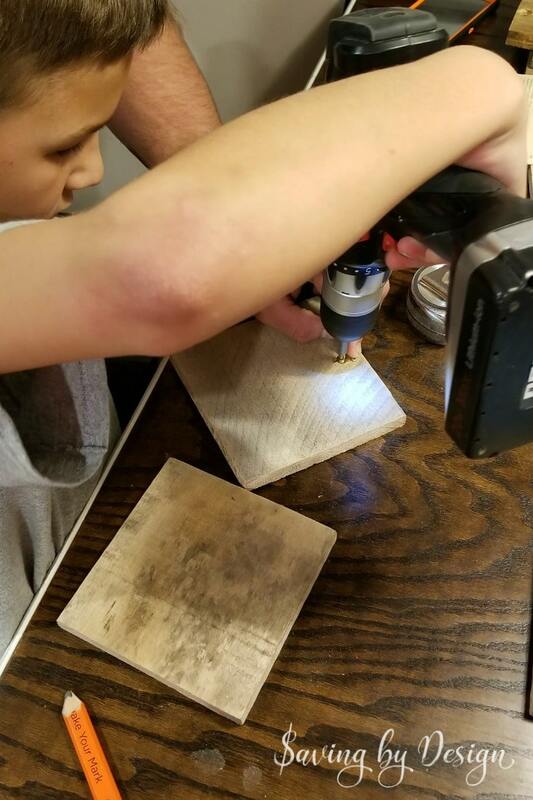 For a nice smooth edge, we sanded the tiles manually using sand paper. If the surface was a bit rough I also sanded that. 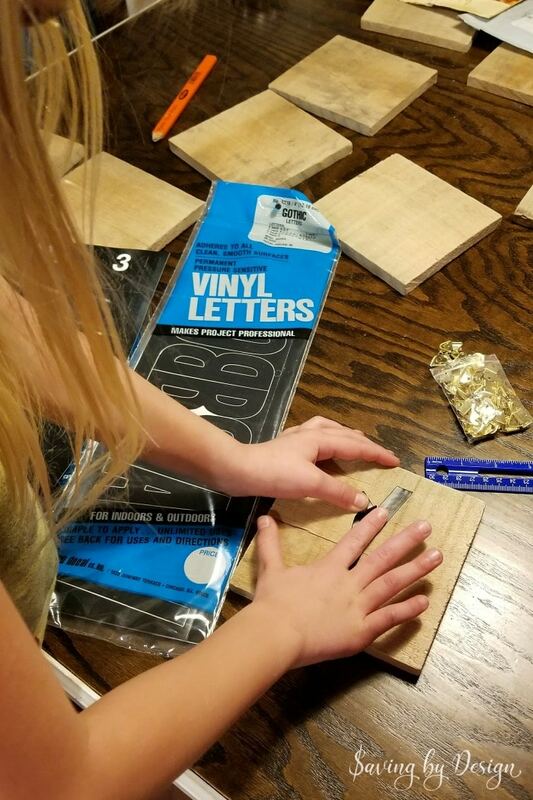 With the help of my kids we applied the vinyl letters and numbers to our tiles. 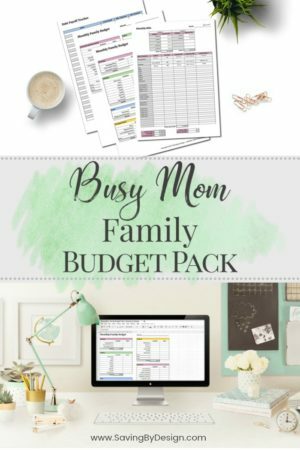 This really is a very simple process…something the whole family can take part in. You simply peel and stick! If you’d like you can also apply a coat or two of mod podge over your tiles after applying your vinyl to seal them. I didn’t do this to mine. 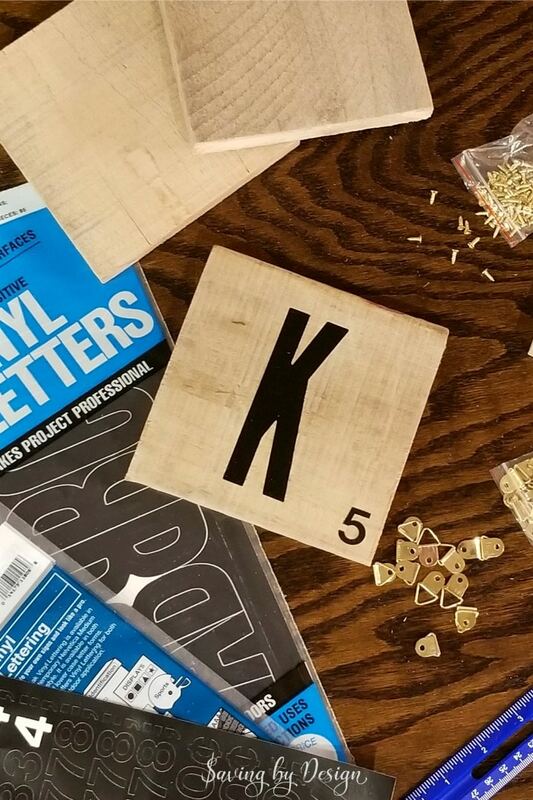 If your tiles have a very rough surface applying a coat of mod podge before applying your vinyl letters and numbers should help even the surface out. One thing to note – if your tile is bowed, you’ll want to hang it on the wall so the bow goes in towards wall with the bow going from top to bottom…make sure you apply your vinyl so it can be hung in that manner. To hang our tiles we used small picture frame hangers. Attaching the hangers wasn’t hard at all – as you can see with a little adult supervision my son also helped us with this. I do admit that when it comes time to actually hang the tiles it’s a bit tedious and requires some measuring and preciseness. 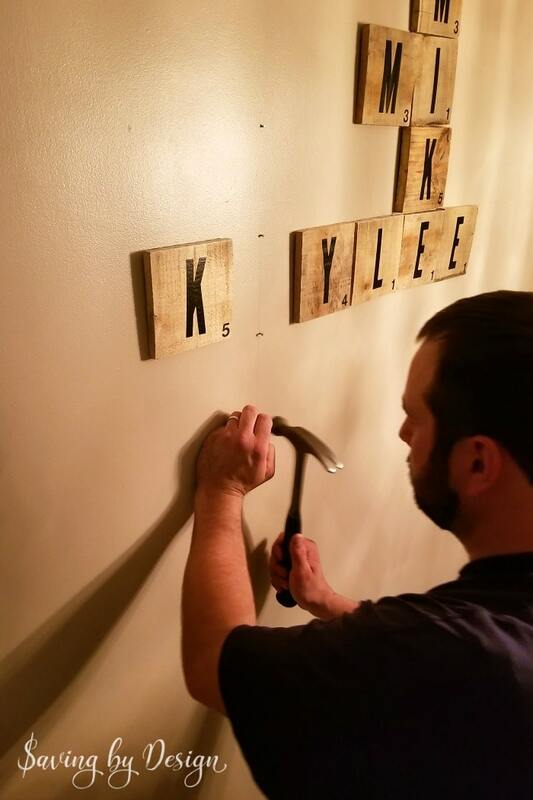 Don’t tell my hubby, but I did come across a much simpler way to hang your wall scrabble tiles after our project was already complete and on the wall. 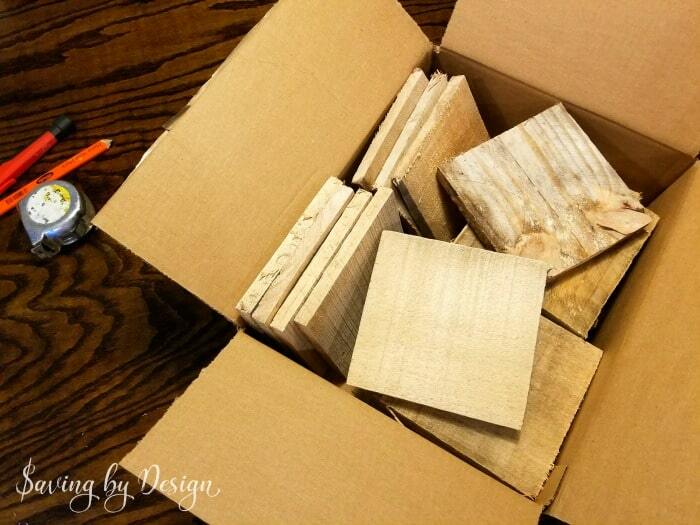 As they did at What’s On My Porch, you can attach your tiles to a few thin pieces of wood. 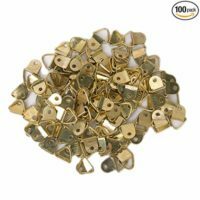 Then using only a few picture hangers or sawtooth hangers you can hang the whole design as one unit. 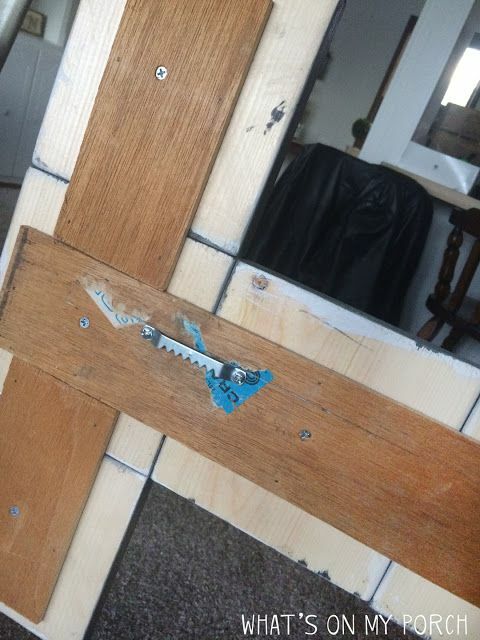 Instead of attaching a picture frame hook to each tile, you can attach your tiles to a few thin pieces of wood. Then using only a few picture hangers or sawtooth hangers you can hang the whole design as one unit as described in blog post. 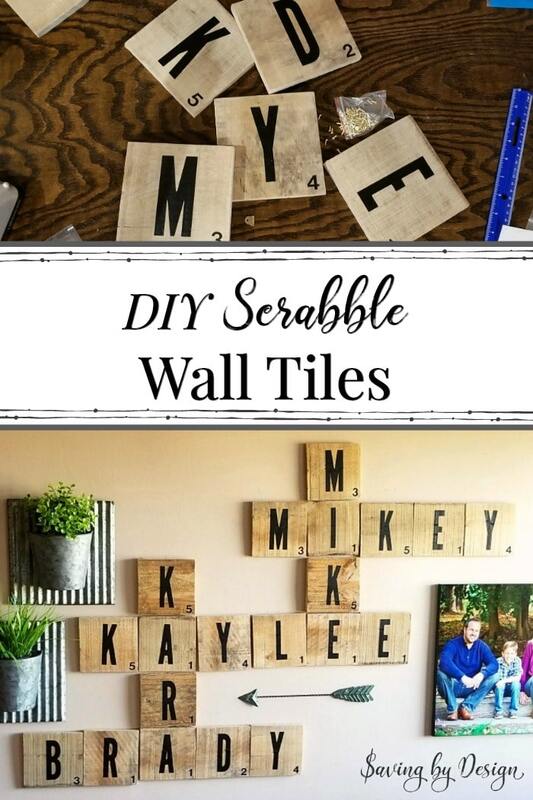 I hope this wall scrabble tile tutorial helps you create the perfect rustic wall decor for your entryway, living room, family room, or any place that needs a little meaningful sprucing up! How to Spray Paint a Wooden Nursery Rocking Chair – It’s Less Than $10!